The Sawgrass Marriott Resort is situated in Ponte Vedra Beach just outside Jacksonville in North Florida. The resort is home to one of the most famous golf courses in the world, the TPC Stadium Course, designed by Pete Dye and home of the Players Championship on the PGA Tour. If you fancy testing yourself against this tough layout including the devilish island green 17th, then there is only one way to do it, stay and play at the Marriott Sawgrass Golf Resort & Spa. Resort facilities and amenities include 2 TPC championship golf courses, 18-Hole miniature golf course, 4 outdoor pools and 3 whirlpools, complimentary shuttle to beach and golf courses, fitness centre and Sawgrass Spa. The resort underwent significant multi million dollar renovations in 2014 including the villas, hotel lobby, Vernon’s Restaurant, Alice & Pete’s Pub, Cabana Beach Club, 619 Oceanview restaurant and Cascades Deck. New to the resort as part of the renovations is the TPC Golf Cart Connection Path which now allows guests to travel by golf cart between the resort and the TPC Stadium Course. Upon entering the resort, guests are welcomed to an open-air porte-cochère that will transform the welcome experience with elements of wood and stone surrounded by landscaped gardens. Throughout the lobby area, guests will see panoramic views of the 63-acre resort through floor-to-ceiling windows revealing the waterfall, lagoon, deck, swimming pools, Floating Hole and the nearby TPC Sawgrass course. The lower lobby welcomes guests to a convivial space where they can gather, relax, read, dine and drink. New oversized furnishings and warmer hues set the tone for an inviting atmosphere that resembles that of a private residence. Local attractions include Jacksonville Beach, Ponte Vedra Beach, Historic St. Augustine and the World Golf Village, home of the World Golf Hall of Fame. The Marriott Sawgrass Resort has two outstanding Pete Dye designed golf courses on-site. 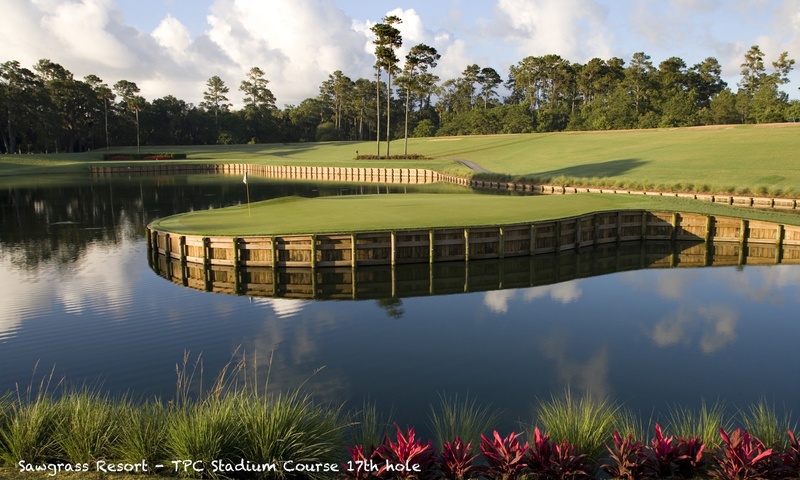 Consistently ranked among the top golf courses in the world and home to the Players Championship on the PGA Tour, the TPC Stadium course needs no introduction. It is one of Pete Dye’s iconic designs with the signature island green 17th hole well known to pretty much everyone who’s ever played golf. The Stadium course is a strategists dream with decisions to make on virtually every hole, best not bring your B game! With wide rolling fairways, larger greens and challenging water holes the Dye’s Valley Course is a gentler test than the Stadium course but is nevertheless a fun course to play. We can also provide rates on a number of local courses including the highly rated Marsh Landing Country Club and Sawgrass Country Club. Before the TPC Sawgrass complex was built Sawgrass Country Club hosted the Players Championship with past champions including Jack Nicklaus, Lee Trevino, Mark Hayes, Raymond Floyd and Lanny Wadkins. Marsh Landing runs along the Intracoastal Waterway and is an exclusive 18 hole private club with limited access to outside play but we can book tee times for guests staying at the Marriott Sawgrass Resort. It is recognised as one of the most scenic courses in Florida. If you fancy a golfing day out then we can also book you on either of the two courses at the World Golf Village near St. Augustine, home of the World Golf Hall of Fame. King & Bear, named after it’s co-designers Arnold Plamer and Jack Nicklaus is the better of the two. It is a picturesque course with some memorable par 5’s. The Slammer & Squire course, named after Sam Snead and Gene Sarazon, consultants to designer Bobby Weed is also a picturesque layout with some excellent par 3’s framed by preserved woodlands and wetlands. The Marriott Sawgrass Golf Resort and Spa is a sprawling resort offering hotel rooms and suites and scenic villas. There are 511 guest rooms, 24 spacious suites and 80 residential style 1 and 2 bedroom villas. All rooms and suites feature flat screen TV’s, cable TV with premium channels, dual line phones with voicemail, high speed wired and wireless internet access, bedding with down comforters, iron and board, complimentary newspaper, bathrobes, hair dryer, refrigerator, daily housekeeping, massage and spa services available. The suites feature separate living areas with ergonomic chairs, large work areas, and expansive bathrooms with chrome fixtures. In addition, villas offer TV’s in living room and bedroom, spacious one or two bedroom layouts, large living room, patio with sliding doors and water views, wet bar with microwave, small fridge and coffee maker. There are several dining options on the resort itself. Vernon’s is the signature restaurant at the Marriott featuring fresh seafood, hand cut chops and more along with a comprehensive wine list. Vine’s is the new wine bar which has a happy hour daily from 5-7pm. Alice & Pete’s Pub is a casual dining venue with inside and outside seating serving a range of appetisers, entrees and desserts along with craft beers and specialty drinks. Hours are 11am to 2am and it serves food until midnight. If ocean front dining is your thing then 619 Ocean View offers fresh Florida cuisine including seafood, steaks and nightly specials. Dishes include Filet Mignon, Roasted Grouper and Mushroom ravioli or you can enjoy the catch of the day. Hours Wednesday thru Sunday 5:30pm to 9:30pm, valet parking available Friday and Saturday nights. There are also a number of casual dining options. Starbucks Coffee Shop situated in the upper lobby, The Pool Bar serving salads, burgers, hot dogs and frozen concoctions, Sharkey’s Snack Bar at the Cabana Beach Club, open Saturday-Sunday 11am to 4pm, Sea Porch Bar & Grill also located at the Cabana Beach Club, opens Monday to Thursday 11:30am to 9pm, Friday to Saturday 11:30am to 10pm and Sunday 10am to 9pm. Finally, Soothies Café at the Sawgrass Spa serves energizing drinks and spa cuisine, open Saturday to Sunday 10am to 6pm. If you want to go further afield then there are numerous restaurants, bars and cafés in the Ponte Vedra Beach area. The Sawgrass Spa is an oasis situated in 63 acres of lagoons, moss-draped oaks, twisted palms and giant magnolias. It offers all the services and treatments that you would expect including massage therapy, hydrotherapy, reflexology, body treatments wraps, and skincare. The Spa features 19 private treatment rooms, including hydrotherapy and couples’ massage rooms. Men’s and women’s locker rooms with steams, saunas, whirlpools, and relaxation lounges. A Nail studio, with deluxe manicure and pedicure stations and a retails store for purchasing spa products. There is also an outdoor heated pool, whirlpool and a relaxation area. Stop at Soothies at the Spa for energizing drinks and spa cuisine which is open every Saturday & Sunday 10:00am – 6:00pm. In the spa workout facility with a range of cardiovascular and Cybex strength training equipment. There are a number of specialist classes and fitness programs including basic training, golf fitness, golf stretch, spin class and yoga.